Create chocolate confections that will tease the taste buds with our selection of dipping tools. Our Chocolate Dipping Tools are perfect for dipping various foods into chocolate or candy, great for fondue or to make chocolate covered fruits. Use these professional quality stainless steel tools to dip things into chocolate or candy, great for fondue or to make chocolate covered strawberries. Rigid stainless steel wire spit. 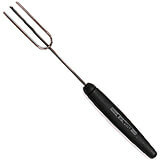 3 prong Fork. 3-7/12" polypropylene handle. Use these professional quality stainless steel tools to dip things into chocolate or candy, great for fondue or to make chocolate covered strawberries. Rigid stainless steel wire spit. 4 prong Fork. 3-7/12" polypropylene handle. Use these professional quality stainless steel tools to dip things into chocolate or candy, great for fondue or to make chocolate covered strawberries. Rigid stainless steel wire spit. 5 prong Fork. 3-7/12" polypropylene handle. Use these professional quality stainless steel tools to dip things into chocolate or candy, great for fondue or to make chocolate covered strawberries. Rigid stainless steel wire spit. Oval Spit. 3-7/12" polypropylene handle. Use these professional quality stainless steel tools to dip things into chocolate or candy, great for fondue or to make chocolate covered strawberries. Rigid stainless steel wire spit. Pear-shaped Spit. 3-7/12" polypropylene handle. 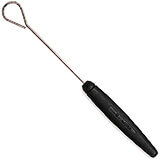 Black, Stainless Steel Chocolate Dipping Tools, Round Head, 0.37"
Use these professional quality stainless steel tools to dip things into chocolate or candy, great for fondue or to make chocolate covered strawberries. Rigid stainless steel wire spit. Round Spit. 3-7/12" polypropylene handle. Measurements: 6/16" Diam. 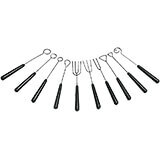 Black, Stainless Steel Chocolate Dipping Tools, Round Head, 0.5"
Use these professional quality stainless steel tools to dip things into chocolate or candy, great for fondue or to make chocolate covered strawberries. Rigid stainless steel wire spit. Round Spit. 3-7/12" polypropylene handle. Measurements: 1/2" Diam. Black, Stainless Steel Chocolate Dipping Tools, Round Head, 0.56"
Use these professional quality stainless steel tools to dip things into chocolate or candy, great for fondue or to make chocolate covered strawberries. Rigid stainless steel wire spit. Round Spit. 3-7/12" polypropylene handle. Measurements: 9/16" Diam. Black, Stainless Steel Chocolate Dipping Tools, Round Head, 0.62"
Use these professional quality stainless steel tools to dip things into chocolate or candy, great for fondue or to make chocolate covered strawberries. Rigid stainless steel wire spit. Round Spit. 3-7/12" polypropylene handle. Measurements: 10/16" Diam. Black, Stainless Steel Chocolate Dipping Tools, Round Head, 0.68"
Use these professional quality stainless steel tools to dip things into chocolate or candy, great for fondue or to make chocolate covered strawberries. Rigid stainless steel wire spit. Round Spit. 3-7/12" polypropylene handle. Measurements: 11/16" Diam. Black, Stainless Steel Chocolate Dipping Tools, Round Head, 0.75"
Use these professional quality stainless steel tools to dip things into chocolate or candy, great for fondue or to make chocolate covered strawberries. Rigid stainless steel wire spit. Round Spit. 3-7/12" polypropylene handle. Measurements: 3/4" Diam. Use these professional quality stainless steel tools to dip things into chocolate or candy, great for fondue or to make chocolate covered strawberries. Rigid stainless steel wire spit. Spiral Spit. 3-7/12" polypropylene handle. Use these professional quality stainless steel tools to dip things into chocolate or candy, great for fondue or to make chocolate covered strawberries. Rigid stainless steel wire spit. Two tine Fork. 3-7/12" polypropylene handle. This Paderno World Cuisine set of 10 dipping forks allow for coating hand-rolled truffles, nuts or fruits with chocolate. Drop nut or fruit into liquid chocolate and use the fork to roll and remove the coated piece to a non-stick mat to cool and harden. Set Of Chocolate Forks. Made of stainless steel, polypropylene handle. For dipping of chocolate candies. 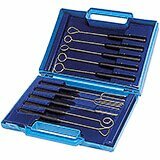 Set includes: 4 round forks diam. 9/16", 5/8", 3/4", 13/16", 1 oval fork, 1 pear shaped fork. 3 forks 2,3 and 4 fines. 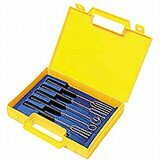 Set of 10 with case. Weight: 15 oz. Set Of Chocolate Forks. Set of 5 with case. 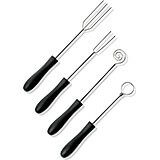 Set includes: 1 round spit 5/8" diameter, 1 spiral spit, 3 forks: 2,3 and 4 tines. Weight: 9 oz.